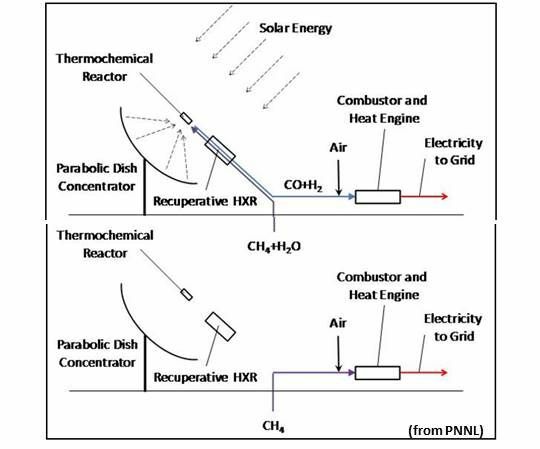 The science might work, but everything else remains to be proven about the new Pacific Northwest National Laboratory (PNNL) process for using heat from concentrating solar power (CSP) to convert natural gas to syngas. The process uses solar energy reflected off mirrors and concentrated on a device that breaks the chemical bonds in natural gas flowing through it and reconfigures it chemically as syngas, a fuel composed mainly of carbon monoxide (CO) and hydrogen (H2). Driving the process with solar energy allows the formation of syngas with a net energy gain of about 25 percent from an endothermic reaction that absorbs the solar heat, explained PNNL Project Lead Bob Wegeng. By using solar energy, a chemical reactor, and heat exchangers in this way, the higher-energy syngas produces about 20 percent to 25 percent more electricity than the natural gas consumed to make it, according to PNNL. That also reduces the emissions from burning by about 20 percent. Wegeng and his team have completed prototype testing and are preparing to study operations at a larger scale. They have funding from the Department of Energy (DOE) and have partnered with entrepreneurs at SolarThermoChemical (STC) to begin planning commercialization, which, Wegeng said, is two to three years away. If the cost of everything it takes to make and transform the syngas into electricity is less than the cost of turning natural gas into electricity, the process could be economically viable. That is, of course, a big "if" to carry across the entrepreneurs' Valley of Death between proof-of-concept and commercialization. 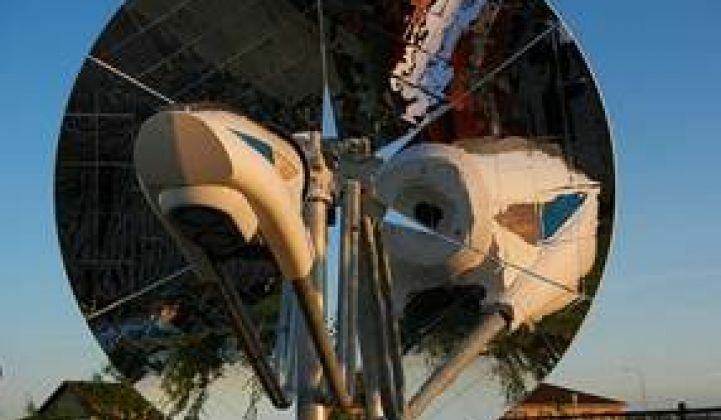 Early tests used solar heat energy from a four-meter-diameter mirrored dish concentrator resembling the CSP products Stirling Energy Systems (SES) and Infinia tried (and failed) to market as solar power plants. Neither Mankins nor Wegeng seemed intimidated by the fact that dish concentrators could not crack the solar power plant market. They believe their concept will be more economic because the syngas conversion by the dish is at least twice as efficient, at 60 percent, as the conversion of solar energy to electricity by CSP dishes, which is at best less than 30 percent efficient. The doubled efficiency also effectively doubles the number of kilowatt-hours derived from a syngas system over the electricity generated by a dish, Wegeng said. Power plant dishes convert solar energy to the work that generates electricity, Wegeng said, while using solar energy to drive an endothermic chemical reaction is more energy-efficient. Neither dish solar systems nor the dish syngas systems have an economically viable method of storage. If storage was needed, the heat generated by a solar power tower could also drive the chemistry, Wegeng observed, though a parabolic trough solar power plant does not achieve a high enough temperature. But a solar storage option is not likely to be more practical or affordable than drawing on always-available natural gas. For a 500-megawatt integrated gasification combined cycle (IGCC) plant, Wegeng estimated he would need a field of about 3,000 dish units, each with the ability “to intercept 100 kilowatts of solar energy.” There would also need to be a network of pipes to deliver natural gas and take syngas to the plant’s power block as well as some form of valve system interface. 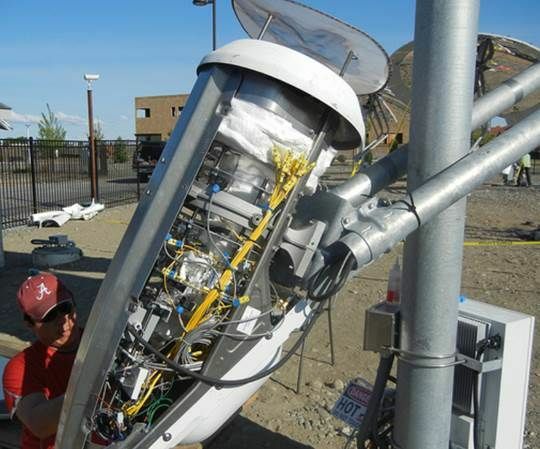 “On the way to commercialization,” Mankins said, “we will have to figure out the right scale.” And, he added, by the time the process reaches commercialization they may have developed a more efficient optical configuration with elements of a tower and a dish. They will also have to figure out how to make the entire infrastructure and process cheaper than a PV plant built next door to a gas plant that provides electricity during peak demand periods, allowing the gas plant to back down. Wegeng and Mankins believe early testing confirmed the solar-syngas system will add only about one-tenth of one cent to the DOE-estimated $0.055 per kilowatt-hour LCOE of an IGCC plant. A fall-back commercialization possibility, Mankins noted, would be to use the solar energy generated syngas to drive fuels cells or to finish the already established conversion of natural gas-based syngas to methanol or synthetic petroleum. Natural gas is selling at $2 MMBTU and crude oil is selling at $14 to $15 per MMBTU, he noted.